It was incredibly difficult to narrow down the photos for this post. I usually try to restrict myself to just ten photos per blog post, but these two people, along with all the folks around them in their wedding images, hold such a special place in my heart that I simply couldn’t pick only ten. Joe is overwhelming responsible for teaching me to love Kirkwood and snowsports and powder days. I often wonder if he knows how empowering he is for the people around him – and girls in particular. He has an incredibly supportive, kind and bolstering nature when he skies with you that allows you to gain skills, the confidence necessary to pull them off, and have an unbelievably awesome time while doing it. There have been so many days in my winter life where Joe has possied up with a group of girls and taken us around the mountain, telling us where to jump and where to straight line and where to go fast, with patience, enthusiasm and encouragement. Not only did he help me fall in love with winter, but he is one of the major reasons I finally fell in love with Tahoe. Maggie is an effervescent basket of laughter. She is all smiles and wide eyes and beauty. She is fun, smart, incredibly beautiful, and has this way of responding in conversations with this perfectly deadpan voice that cracks me up. It’s so obvious how much she and Joe care for each other – it carries over in their laughter and smiles and the twinkles in their eyes. And oh, do their eyes twinkle. Just look at these photos. My friends are rambunctious, adventurous, obstreperous people with a thirst for life that inspires me on a daily basis. I love Maggie and Joe and all of them so much – I just want the whole world for all of them. I want them to be happy, healthy, successful, and to live a life of no regrets because that’s what they inspire me to do. Mags and Ruckus: send it huge, stay safe and have fun. Congratulations to you both. 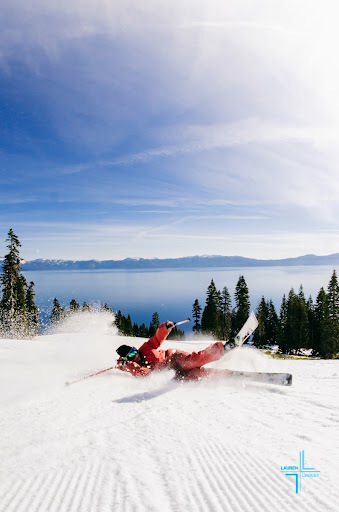 I have to give Homewood Mountain Ski Resort a rousing round of applause for accommodating my models and I for a last minute Tahoe Ski Photography session last week. Neither myself nor any of my friends had skied Homewood before and I must say, this is seriously negligent on my part! 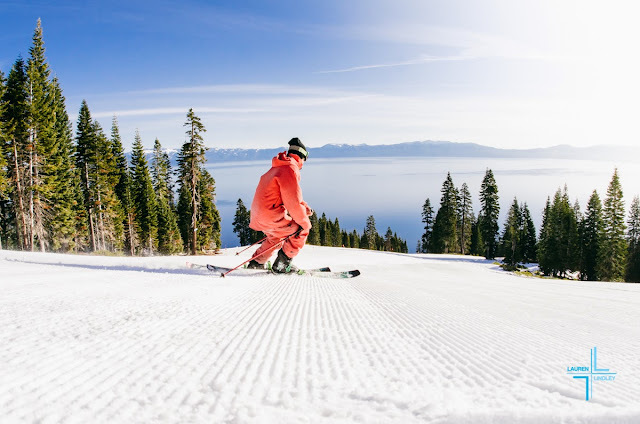 In addition to having some of the best views of Lake Tahoe of any of the ski resorts in the Tahoe Basin, Homewood has a welcoming and charming staff, a legitimate and impressive park, and a family friendly vibe. 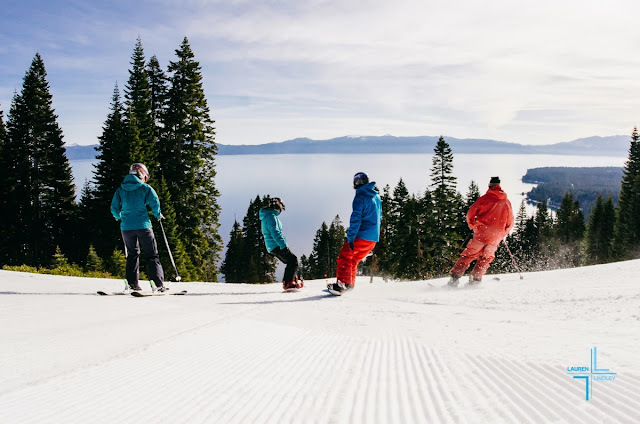 You can relax between runs with an exceptional view of Lake Tahoe at the Big Blue Bar all the while saving some dollars: a 3 pack of tickets to Homewood will only set you back $59/day. 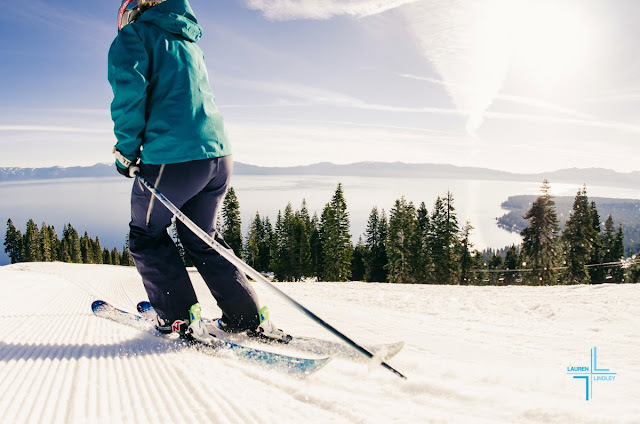 For unrivaled views of the lake, superb service and some quality steeps and tree skiing, come visit Tahoe and check out Homewood Mountain Ski Resort. While you’re there, don’t forget to eat breakfast at my favorite breakfast joint on the lake: The Fire Sign Cafe. I had some really fabulous and gorgeous ski and snowboard models two weeks ago for a Ski Lake Tahoe photo shoot out at Sierra at Tahoe, which is a wonderful local resort in Tahoe South with a small-town vibe and a flirty fun personality. They have great tree runs, fun pillow lines, and pride themselves on their parks. It’s also a great place for families and kids love taking ski lessons at their Burton Star Wars Experience Center. While there are a number of amazing shots I took that are reserved for my client, I always end up with a handful of shots that are different and won’t be used to keep in the photo bank for later uses and to share with the host mountain. 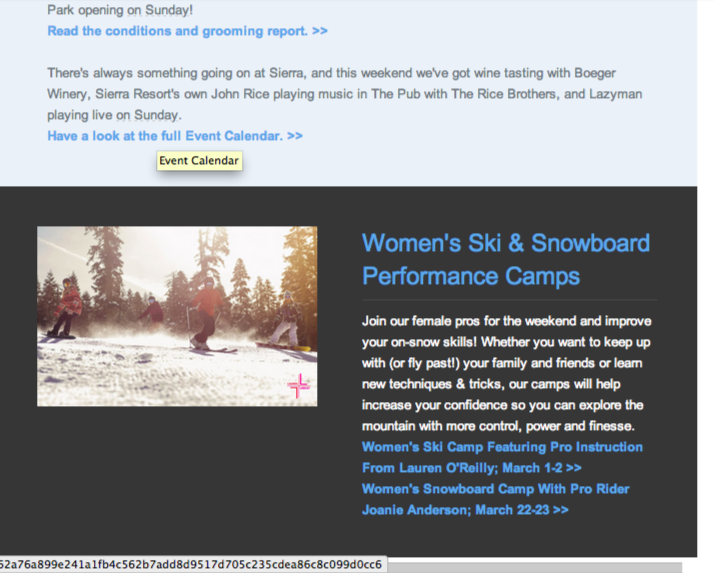 My happy smiling shreddy ladies not only made an appearance on their social media pages, but also in their e-newsletter. I’m also stoked to see my photo on the front of their upcoming Women’s Snowboard Camp Poster. 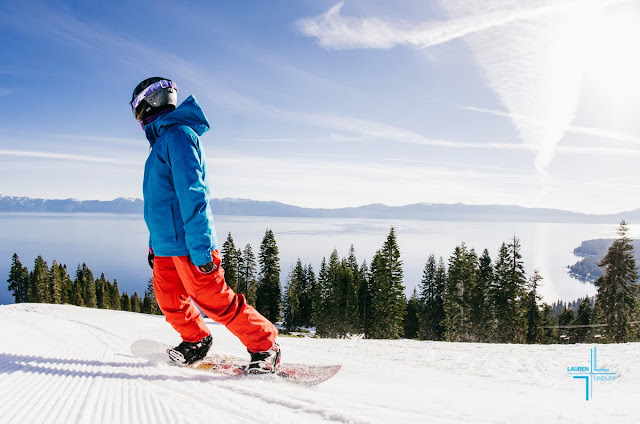 Taught by X-Games Gold Medalist Joanie Anderson, sister to Olympic Gold Medalist Jamie Anderson, this camp would be a fantastic way to further your abilities as a snowboarder. Women’s Snowboard Camp Presented By Burton and Anon. Come join our team of fun female pros for the weekend! Whether you want to keep up with (or catch up to!) your family and friends or learn new techniques, we’re here to help increase your confidence on all terrain. 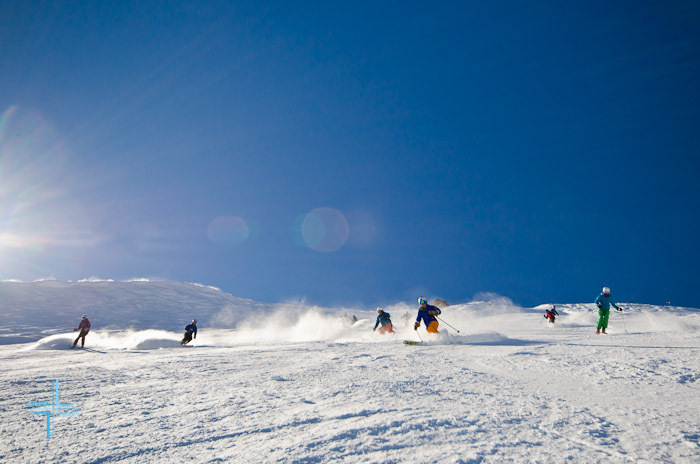 We want you to snowboard and explore the mountain with more control, power and finesse. 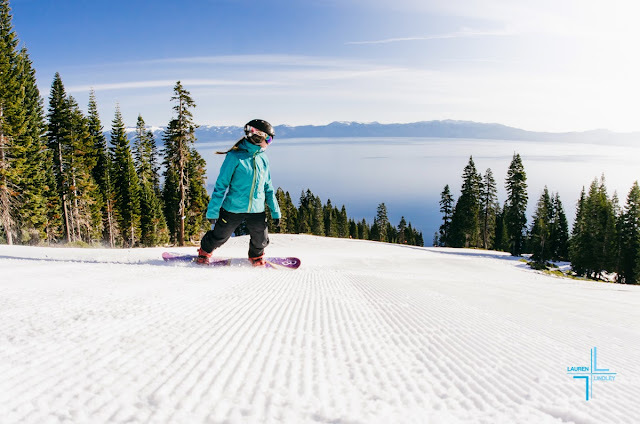 Sierra-at-Tahoe’s all-female learning environment is designed to improve on-hill skill and confidence for women ages 18 and over of any skiing or snowboarding ability. Camps are taught by ability level; we’ve found this to be the most conducive to learning. 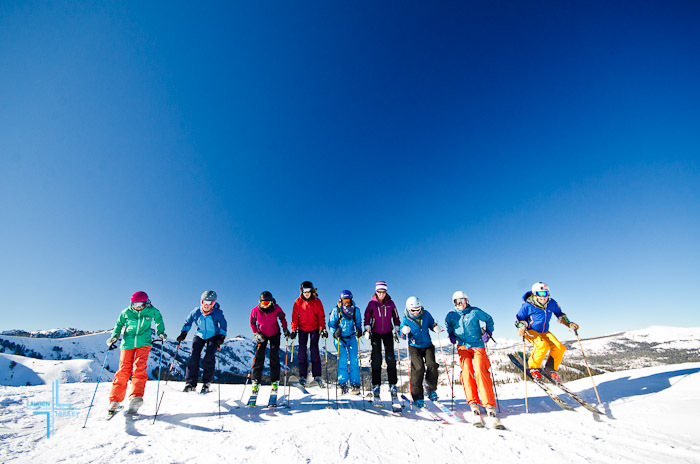 Or, you and your friends can form your own group if you are comfortable skiing and snowboarding together. 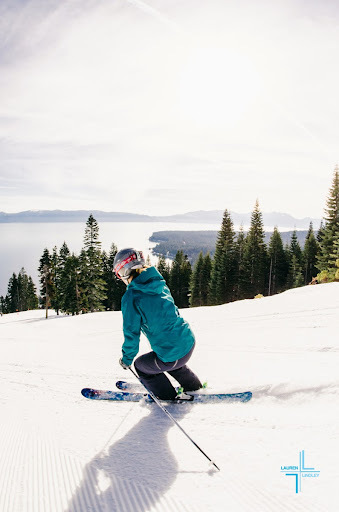 Our Women’s Performance Snowboard Camp is taught by National Champion and X Games Snowboarder X Gold, Silver & Bronze Medalist, Joanie Anderson. 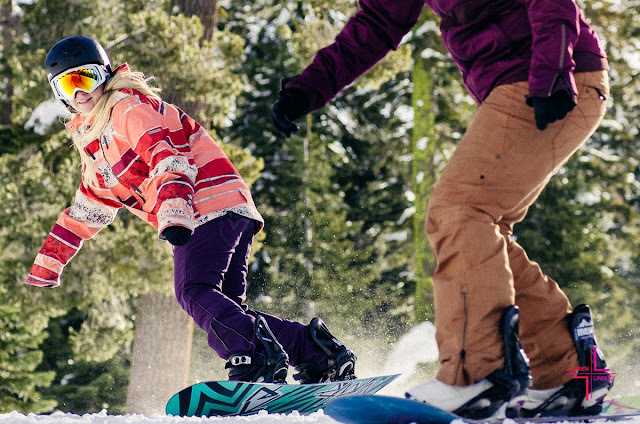 Joanie’s expert instruction and snowboarding know-how will help you step up your snowboarding skills and style. On Saturday, camp starts with a welcome breakfast. 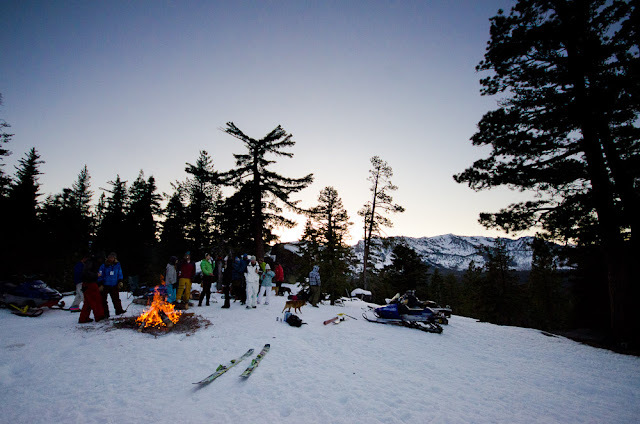 At the end of the day, enjoy Après drinks and snacks on the top of the mountain, overlooking Lake Tahoe. For more information, head over to Sierra at Tahoe. It may not have snowed here yet, but we all have winter fever. It’s always disheartening when you live in a ski town with no snow. Folks who depend on snow for their winter jobs can’t go to work and everyone that wants to ski is anxious. This leads an entire city of alcoholic extremists into a deep depression that certainly isn’t helped by darkness at 4:30 in the afternoon. What it makes me do is think about all the things I wish I could buy right now for this winter season. 1. See that green jacket I’m wearing up there? I’ve had it for as long as I can remember. It’s been with me for most of my ski seasons. It’s still just as amazing as ever, except that I’m sick of it and it’s dirty. What I’m lusting after is the exact same jacket in a sweet new blue. The Arc’teryx Sidewinder is the ultimate shell for me and has proven itself worthy over the last six ski seasons: a watertight offset zipper, an integrated powder skirt, a helmet compatible hood that hides away when not in use, an incredibly durable flat nylon exterior that has taken more than one tumble, and most importantly, it regulates my insane temperature swings like nobody’s business with 3 Layer Gore-Tex fabric and little to no insulation. Just look at that gorgeous shade of blue. I want it so bad. 2. The Midland GXT1000VP4 36 Mile 50-Channel Two Way Radio Set is going to make it significantly easier for me to talk to athletes I’m photographing on the mountain. Cell phones require un-gloved hands and sometimes cell reception is spotty to non-existent here in Tahoe. With a wide range and great reviews from skiers who have used them in wet heavy snowfall with no problems, these are number one on my Christmas-Wish-List-of-Things-that-People-Can-Actually-Afford-to-Buy. 3. 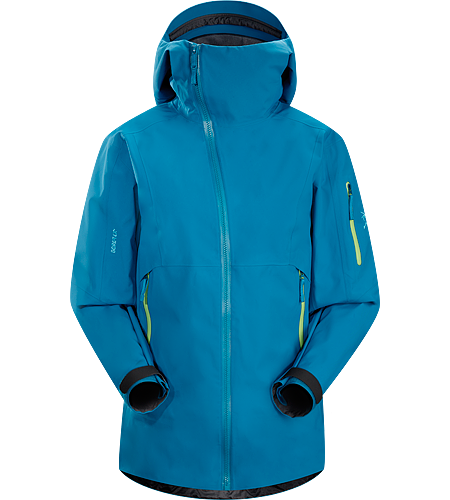 I have a lack of puffies in my life and Mountain Hardware‘s Ghost Whisperer Down Jacket is just the piece to fill that void. It’s the lightest full-featured down jacket on the market, weighing in at 7 oz despite its features: 850-fill goose down, zip-pockets and a cinch hem. 4. Nikon 70-200/2.8 – I can’t afford this yet so I have a feeling I’m going to be renting it an awful lot this winter to shoot adventure photography. 5. The POW Photog Gloves are the second step to solving a serious problem I had all last winter: freezing hands (the first step, by the way, is becoming a skier). With sticky rubber on the palms to help you grip your gear and foldable finger tips for full dexterity, I can wear these solo on warmer days or stuffed inside a heavier glove on super cold ones. 6. The Induro Carbon Fiber Monopod – light enough to schlep up the hill, heavy enough to get tack sharp images. Can you believe I’ve been in California for seven years years now and I’ve never been to Mammoth Lakes to ski? The horror! When PSIA asked me to donate photobooths to their annual spring convention at Mammoth, I was more than happy to do it! 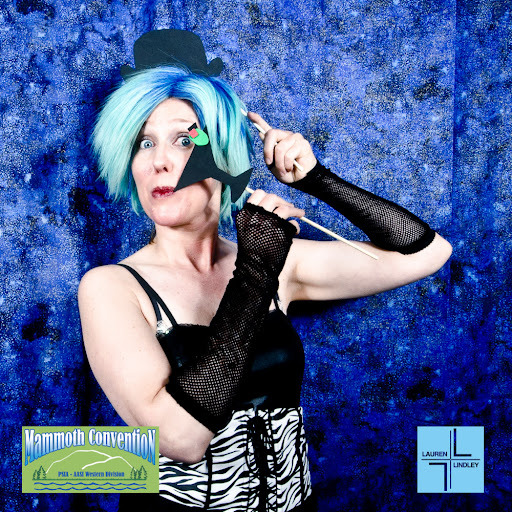 A few days spring skiing in sunny Mammoth Lakes and photobooth fun: I’d be crazy to say no! Bri and I met up with Meghan Kelly, her husband, and a few of our other Tahoe friends for a mini Mammoth Ski trip. While I may have not reached my goal of sixty days on mountain this ski season, but I at least ended it with one of my more memorable ski weekends to date. Mammoth Lakes is a gorgeous place to visit and even more unbelievable from the top of the gondola! Looking for the PSIA Photobooth Photos? The PSIA Flashback Prom Photobooth was a riot, once everyone got liquored up! If you were in my photobooth at the event, your galleries will always remain here on my page in the 2013 tab of the Photobooth Gallery under Portfolio. If you want to travel to Mammoth Lakes, here are my recommendations. STAY: The Cinnamon Bear Inn is located just of Main Street in Mammoth Lakes and is so adorable it hurts. Literally. There are four poster beds with patchwork quilts and doilies. It’s run by Pam and her husband, who personally cook and serve you a hot breakfast every morning and offer afternoon apres ski drinks and appetizers in the “lobby” which feels more like your own living room. If you’re used to the Westin, this is not the place for you: it has it’s quirks (like slow draining tubs), but in my world, that’s all the more reason to love it. Old New York Deli and Bakery has bagels to die for. Bagels like I haven’t ever found out west: crisp shells and doughy centers in all the best flavors, including salt, sourdough and egg! Substitute cream cheese on your fried egg sunrise bagel sando in the morning and you’ll get the best of both worlds: New York style bagel and schmear meets breakfast sandwich. Toomey’s is famous in California for it’s gourmet meals, served without an ounce of pretentiousness, in odd, quirky and unbecoming locations. If you think it would be wonderful to eat a loaded seafood jumbalaya amidst baseball jerseys and collector metal lunchboxes from days gone by, don’t skip a meal here. Stellar Brew has killer coffee and loaded sandwhiches, perfect for grabbing on your way to or from the mountain. 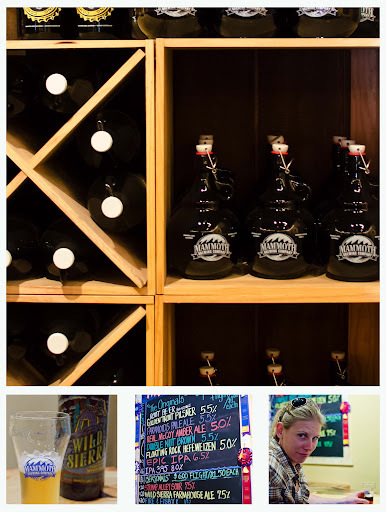 Get a growler filled and enjoy a tasting sampler of either some or all of the brews that Mammoth Brewery has going in their tasting room. At $4-$6 (regular/seasonal) for tasting rounds, it’s hard to argue against spending an hour in here. It’s happy hour every day from 4:00-5:30 pm at Whiskey Creek in both Mammoth and Bishop – save a fortune on Mammoth Brewery drafts and get half off bar menu items. 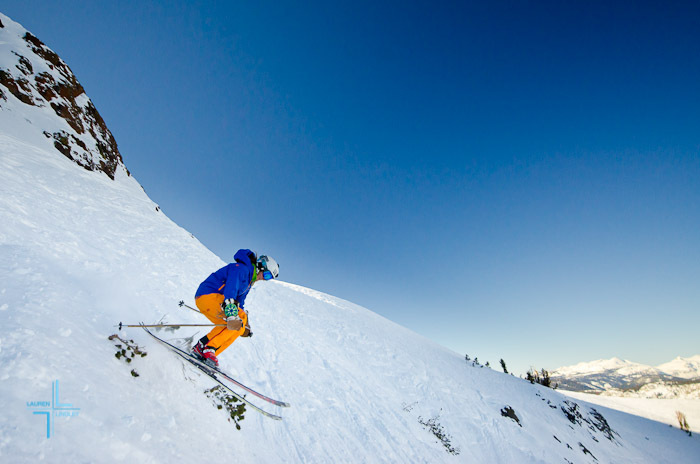 Mammoth Mountain routinely opens earlier and remains open later than other California resorts. It’s well known for it’s summer skiing. You might want to get there soon – it’s brewing in the rumor mill that Vail Resorts is about to purchase Mammoth and they will probably ruin every ounce of personality this wonderful place has. In the summer you can purchase day tickets to mountain bike from top to bottom. Take a day off from the slopes and visit June Lakes, an absolutely stunning series of lakes and rivers set under towering peaks and next to a quaint mountain town. 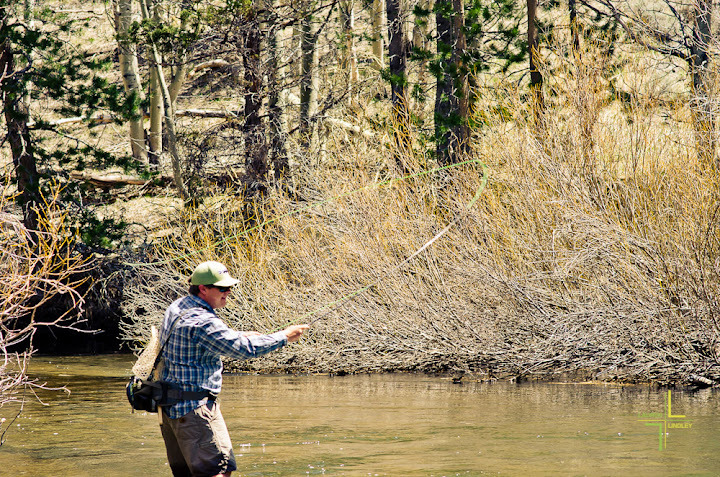 Pat Kelly fishes in a stream near June Lake, CA. 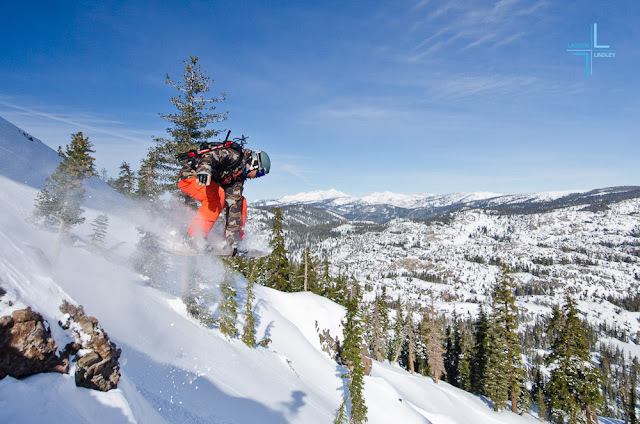 Mammoth Mountain was formed in a series of volcanic eruptions that ended 57,000 years ago and still produces hazardous volcanic gases that kill trees and caused ski patroller fatalities in 2006. As a result, hot springs are abundant in the area. Bishop, CA is one of the western US’s best epicenters for rock-climbing. Make it a tri sport weekend: fish, bike and climb! Two of my friends from Texas came to visit last weekend and I couldn’t have been more excited to see them. We had an amazing weekend together. I was able to take off work the whole time and we skied at both Heavenly and Kirkwood, had leisurely mornings that involved my favorite meal of the day at both the Getaway Cafe and Firesign Cafe, kicked it at the Divided Sky one evening with all of my friends, and ended up at the Backyard BBQ behind our house one afternoon. Despite the fact that it was a holiday weekend, I knew how to skirt the crowds of tourists and we ended up with very little lift lines, great groomers to play on and I even put on skis one day! Proof is in the photo! I have a lot of really amazing friends that also happen to be really amazing athletes. They do things like throw themselves off jumps with 100 foot gaps and launch themselves out of giant halfpipes. I took photos of them at Heavenly Mountain the other doing just this sort of thing and I’m really happy with the photos we got. It was such a fun time and I can’t wait to go back and do it again! Big thanks to JJ Shiller, Doug “Dougie Fresh” Carr, Tele Doug, Extreme, and Trout for going big. Meghan Kelly is the Northern CA director for SheJumps, which I’ve spoken a bit about on here. On the 2nd Sunday of every month, SheJumps hosts Get the Girls Out Day all around the country, a campaign aimed to bringing communities of outdoor loving females together on one day to celebrate sports and having fun. We had about 20 girls come out to play that afternoon and I brought my camera out to document the action. We had a blast! 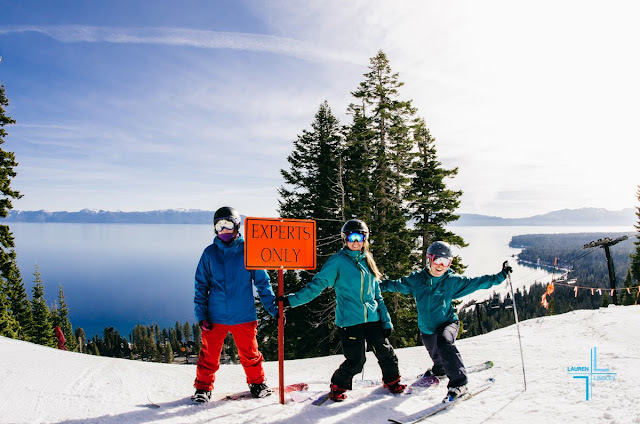 It’s so contagious to see a roving pack of girls shredding up the mountain – people can’t help but woop and holler for us! You can see all the photos from our afternoon of shredding here. If you (are a girl) and would like to join in on the fun, the next dates for Get the Girls Out Day are February 10, March 10 and April 14, 2013. We meet at 1:00 PM at the bottom of Chair 6 at Kirkwood Mountain Resort.